Given the mainstream media’s histrionic reaction to (still-unproven) allegations that Moscow is employing cyberwarfare to influence the outcome of our presidential election, it is perhaps worthwhile to revisit America’s own fabled history of gentle, good-natured meddling in the affairs of other countries. The following is a very brief review of some of Uncle Sam’s most infamous geopolitical machinations since the end of the second World War. This list is by no means exhaustive, and the reader, should he or she wish to be apprised of all the squalid details, is encouraged to check out the writings of American historian William Blum. Iran, 1953—Operation AJAX, as it was officially known, marked the CIA’s first successful regime change exercise and served as a blueprint for future operations. The target was Iran’s first democratically elected Prime Minister, Mohammad Mossadegh, who made the mistake of advocating for the nationalization of Iran’s oil industry—a serious crime in the eyes of the imperialist West. Working in lockstep with MI6, the CIA engineered a military coup, restoring the shah (Iran’s monarch) to power and decapitating a fledgling democracy. The shah ruled with an iron fist until he was forced into exile during the 1979 Islamic Revolution, at which point Iran became the retrograde Shiite theocracy—and “existential threat”—we know today. Guatemala, 1954—The Guatemalan Revolution of 1944 saw the despotic Jorge Ubico, a Washington favorite, chased out of power by a popular uprising. Next came Guatemala’s first crack at representative democracy. The net result was a left-leaning populist president—Jacobo Arbenz—who the US government decided it couldn’t live with. A CIA-authored coup, codenamed Operation PBSUCCESS, was executed in 1954. The outcome: Arbenz was overthrown, Guatemalan democracy was defeated, and a series of blood-drenched, US-supported dictators ruled the country for the next four decades, torturing and slaughtering with impunity. Syria, 1957—Following years of aggressive meddling in Syrian politics, the CIA led efforts to manufacture an uprising against Shukri al-Quwatli’s democratically elected, secular government, on account of the fact that it was too tolerant of communism (Quwatli had already been overthrown once before, in a 1949 coup that may or may not bear Washington’s fingerprints). Ultimately, the CIA’s machinations backfired, pushing a previously-neutral Syria away from the West and toward the Soviet Union, which helps to explain Russian policy re: the current conflict in Syria. This, by the way, comes in addition to the three million-plus Vietnamese casualties. Cambodia, 1969-1975—American intervention in Cambodia’s bloody civil war was an extension of US aggression in Vietnam. Beginning in 1969, the US military launched a widespread—and largely indiscriminate—bombing campaign against communist positions in Cambodia, laying waste to the countryside and killing scores of civilians in the process. This continued until the Khmer Rouge, led by the sadistic Pol Pot, took over the government in 1975, setting the stage for one of the worst genocides in history. Absent the relentless saturation bombing of Cambodia’s rural population, it is unlikely that the Khmer Rouge would ever have gained the popular support necessary to seize power. Laos, 1960-1973—Civil war broke out in Laos after a US-backed military coup removed from power the popular left-wing NLHS party and enthroned the far-right-wing General Phoumi Nosavan. The ensuing conflict quickly became an adjunct to the war in Vietnam, and by 1964 the US had launched a full-scale aerial bombardment of northern Laos, which all but obliterated the peasant society. The US also regularly bombed the so-called Ho Chi Minh Trail in southern Laos, while the CIA secretly managed a mercenary army tasked with fighting the China- and Soviet-backed NLHS. 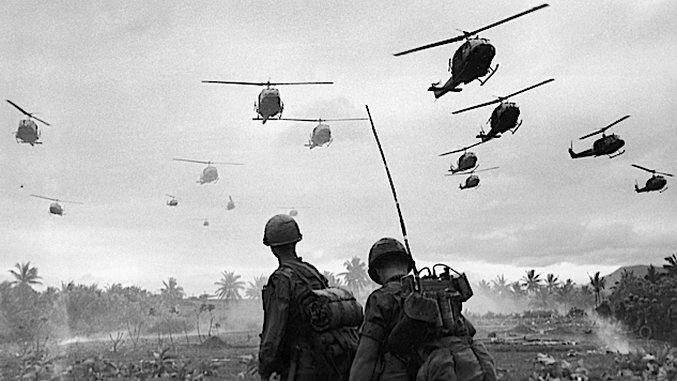 CNN recently published an article detailing the horrifying aftereffects of our war on Laos. Read it. Cuba, 1961-62-—The United States’ well-documented antagonism toward Fidel Castro’s revolutionary socialist government first came to a head in April 1961, when a CIA-sponsored militia—”Brigade 2506”—launched an abortive military operation on behalf of the Kennedy administration. The offensive, dubbed the Bay of Pigs, was neutralized by Castro’s security forces in a matter of days, and the participants were arrested and imprisoned. Following the Bay of Pigs humiliation, the CIA undertook to depose Castro using less conspicuous means. Officials in charge of “Operation Mongoose,” for instance, sought to galvanize fifth columnists within Cuban society and tried numerous times to facilitate Castro’s assassination, to no avail. Velasco was forced out in 1961 and replaced by Vice President Carlos Julio Arosemana. But Arosemana was himself found to be insufficiently hostile to Cuba/communism, and was thus subjected to the same treatment as his predecessor. Finally, in 1963, a proper coup d’état took place. The resulting military junta cracked down on civil liberties and, to the CIA’s pleasure, declared communism a punishable crime. Dominican Republic, 1963-65—After Washington’s man, the brutal Rafael Trujillo, was assassinated in 1961 (concluding 31 years of US-approved tyranny), free elections were held in the Dominican Republic for the first time in more than three decades. Left-leaning populist Juan Bosch was elected president in 1962—and dislodged by a CIA-sponsored coup after only seven months in office. In 1965, when the coup regime came under threat from a popular revolt, Lyndon Johnson authorized a military invasion of the Dominican Republic. Three thousand people were killed as a result. Once the dust settled, a dubious election was held that saw the previously-deposed Bosch defeated by Washington’s favored candidate. Chile, 1970-73—When the Nixon administration failed to prevent Chilean socialist leader Salvador Allende from securing the presidency in 1970, undermining his democratically elected government quite naturally became a CIA priority. Three years of black operations—including intensive efforts to, in Nixon’s words, “make the [Chilean] economy scream”—culminated in what’s often referred to as “the other 9/11”: on Sept. 11, 1973, a bloody military coup deep-sixed Allende (who “committed suicide” in the presidential palace) and ushered into power army chief Augusto Pinochet. The US government promptly lent the full weight of its support to the military junta, condemning the people of Chile to 17 years of extreme totalitarian repression. Bolivia, 1971—Nixon and Kissinger had another pest to dispose of in Bolivian president Juan Jose Torres, whose socialist policies threatened to cut US investors out of Bolivia’s economy. As such, the CIA was assigned its usual task of destabilizing and ultimately overthrowing Torres’ democratic government. A military coup in 1971 proved fruitful: substituted for Torres was General Hugo Banzer, who had previously attended military academies in the United States. Seven years of harsh military dictatorship followed. A truly textbook case of US-led regime change. Nicaragua, 1981-89—In what is perhaps the CIA’s most notorious conspiracy, a coalition of right-wing militias, known collectively as the Contras, were tasked with bringing down Nicaragua’s revolutionary Sandinista government. For nearly 10 years, and in stark violation of a congressional mandate, the CIA financed and directed the Contras’ criminal activity inside Nicaragua. In 1986, the International Court of Justice found the US to be (among other things) “in breach of its obligation under customary international law not to intervene in the affairs of another State” and ordered it to pay Nicaragua $370.2 million in reparations. In a breathtaking display of hubris, the US simply rejected the court’s verdict, citing a lack of jurisdiction, and the clandestine war raged on until the Sandinistas were defeated in a 1990 election. Venezuela, 2002—When democratically elected Venezuelan president Hugo Chavez was briefly unseated by a military coup in April 2002, the Bush 43 administration wasted no time expressing unilateral support for Pedro Carmona’s illegitimate interim government. This in spite of the fact that Carmona’s first order of business had been to suspend Venezuela’s ratified constitution—a decidedly undemocratic course of action. A wave of popular opposition to the coup had the effect of restoring Chavez to power a mere two days after he’d been deposed. It was later revealed that, in the years preceding the coup attempt, the National Endowment for Democracy (NED) had donated hundreds of thousands of dollars to a number of Chavez’s political opponents. The NED receives its funding from the US Congress. Since Zelaya’s expulsion from office, a wave of state-sponsored political violence—including arrests, torture and assassinations—has terrorized Honduran society. Libya, 2011—Flouting a UN Security Council resolution, which authorized a no-fly zone in order to protect civilians ostensibly being massacred by Muammar Gaddafi’s death squads, the US and its NATO allies carried out a full-scale bombing campaign against the Libyan Army and other forces loyal to the government. In the end, Gaddafi was captured, raped and murdered by a group of rebels, creating a power vacuum of which ISIS and other terrorist gangs have taken full advantage. Libya is now a failed state. Syria, 2006-present—Diplomatic cables published by WikiLeaks reveal that US officials were plotting to destabilize the government of Bashar al-Assad in 2006, a full five years before the current conflict began. Exploiting and fomenting sectarian divisions—now ripping the country to shreds—as well as channeling money to Assad’s political opposition were central to this project. When the violence erupted in 2011, the US government joined its regional allies—Saudi Arabia, Qatar, Turkey—in facilitating the transfer of weapons and personnel to Syria’s “moderate rebel” groups, in contravention of the basic principles of international law. Many of the armaments were stolen from the recently-dead Gaddafi’s arsenal in Libya and funneled into Syria via the Turkish border. This was done with full knowledge of the fact that the Syrian uprising was spearheaded by jihadists. Click here for more on the US government’s nefarious role in Syria. Ukraine, 2014—Ukraine became the first theater of the new cold war when the Obama administration stood behind the violent uprising—led by fascist, neo-Nazi elements in western Ukraine—that forced democratically elected President Viktor Yanukovych into exile. Shortly before the coup, Yanukovych had decided to reject an imperious offer from the EU, which dictated that the Ukrainian government sever its longstanding ties to Russia in favor of a closer relationship with the West. The offer featured a number of harsh economic conditions designed to open up the Ukrainian economy to foreign investors. When Yanukovych, siding with the ethnic Russians living in eastern Ukraine, declined the EU’s offer and restated his government’s commitment to Moscow, armed protesters stormed the capital and within days Yanukovych’s opposition had taken control of parliament. Rather than condemn this extralegal overthrow of a constitutional government, the US declared it a victory for Ukraine’s democratic forces and helped usher into power billionaire oligarch Petro Poroshenko. A devastating civil war has engulfed the country ever since. To reiterate: The foregoing list is far from comprehensive; it’s merely a sampling of Washington’s historical disregard for international law and the sovereignty of other states. Certain affairs—for instance the staged coup in Indonesia in 1965, which led to years of mass slaughter—were omitted because the extent of US involvement remains unknown. To cover the whole story is probably impossible anyway, since the CIA has no doubt managed to keep under wraps more than one or two of its innumerable conspiracies. It’s important to note that many of the examples above illustrate a further disregard, or perhaps out-and-out contempt, for democracy itself—which the United States supposedly embodies and would like to see embraced across the world. If the Russians have in fact undertaken to tilt our national election in favor of their preferred candidate, a sincere thank-you may be in order, for their machinations seem to have had the effect of alerting the American Empire to the fact that its own medicine tastes very noxious indeed. Perhaps now, after 70-plus years of imperial hubris, we’ll stop administering it. But then again….